In 2019, we are inviting several hosts to manage the @ActLenguas (Language Activism) Twitter account and to share their experiences with the revitalization and promotion of their native languages. This profile post is about Janet Chávez Santiago (@JanChvzSanti) and what she plans to discuss during her week as host. 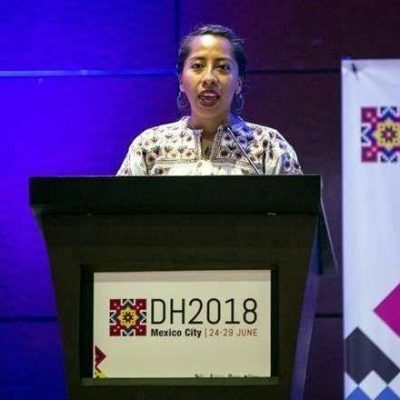 Mi nombre es Janet Chávez Santiago y soy originaria de la comunidad zapoteca de Teotitlán Del Valle, Oaxaca, Mexico. He trabajado una metodología para la enseñanza de zapoteco de la variante de Teotitlán Del Valle (ZTdV) como segunda lengua, así mismo he creado los materiales y enseñado el curso que he llamado “te ganiun dixza xtee Xigie”. En 2013, en colaboración con la Universidad de Haverford a través de la profesora Brook Danielle Lillehaugen iniciamos el diccionario parlante en zapoteco de Teotitlán Del Valle (Teotitlán Del Valle Talking Dictionary) http://talkingdictionary.swarthmore.edu/teotitlan/ Para las grabaciones de palabras han participado nativo hablantes del ZTdV. My name is Janet Chávez Santiago and I am originally from the Zapotec community of Teotitlán Del Valle, Oaxaca, Mexico. I have developed a methodology for the teaching of Zapotec of the Teotitlán del Valle variant (ZTdV) as a second language, and I have also created the teaching materials and taught the course that I have called “te ganiun dixza xtee Xigie”. In 2013, in collaboration with the University of Haverford through Professor Brook Danielle Lillehaugen, we started the Zapotec talking dictionary of Teotitlán Del Valle (Teotitlán Del Valle Talking Dictionary). For the recordings of words, we sought the participation native speakers of the ZTdV language. Poco a poco el zapoteco, no solo de Teotitlán, pero de otras poblaciones en el Valle, está teniendo más presencia en las plataformas digitales como en el caso de los diccionarios parlantes en cuatro variantes del Valle de Tlacolula: http://talkingdictionary.swarthmore.edu/zapotecs/ o a través de proyectos como @VocesValle / #UsaTuVoz, que animan a hablantes a escribir en su lengua usando Twitter cómo plataforma. Little by little the Zapotec language, not only of Teotitlán, but from other towns in the Valley, is having more presence in the digital platforms, such as the case of the talking dictionaries in four variants of the Tlacolula Valley o through projects like @VocesValle / #UsaTuVoz, which encourage speakers to write in their language using Twitter as a platform. En esta semana compartiré información acerca del zapoteco de Teotitlán Del Valle, también visibilizar otros proyectos que están enfocados en la documentación, enseñanza y uso del espacio digital en zapoteco principalmente Del Valle. Así mismo voy a usar este espacio para compartir información acerca de encuentros, conferencias y talleres que se enfocan en la difusión de las lenguas indígenas y de su presencia en el espacio digital. This week I will share information about the Zapotec of Teotitlán Del Valle language, and also make visible other projects that are focused on the documentation, teaching, and the use of digital spaces in the Zapoteco language, mainly the Del Valle variant. I will also use this space to share information about meetings, conferences, and workshops that focus on the dissemination of indigenous languages and their presence in the digital space.